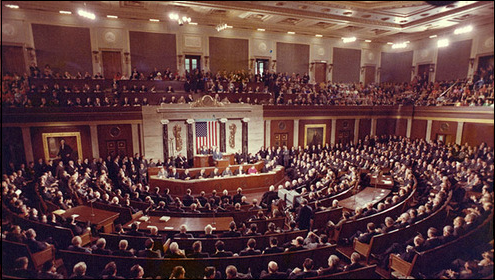 When I was young and naïve - a period of time which ended for me when I was 38 or so - I used to dream of standing on the rostrum in the House chamber, giving the State of the Union address. However, it's become apparent over the last couple of decades that the closest I'll get to this is using a picture such as the above* to accompany an address on the State of the Blog. *By the way, do you like that picture? I wanted to carefully avoid any sign of partisanship, so I went far back in time, and used one in which the face of the president was nearly invisible. If you blow it up enough, though, you might be able to figure out who it is. For several years I did a State of the Blog over at In Other Words, but my involvement there has necessarily diminished over the years, and so as we enter the fifth full year of this blog, as well as the first day of 2016, I thought it might be appropriate to take a step back from our everyday subject matter and discuss the blog itself - past, present, and most important, future. It may be hard to believe, but when I first began It's About TV! in 2011, I foresaw it as a once-a-week, maybe even once-a-month, blog. I'd started writing more frequently about television at In Other Words, and I found that I needed a dedicated TV blog for the in-depth pieces I didn't have room for otherwise. Needless to say, It's About TV! has now become the dominant blog of the two, and it's continued to expand every year. In fact, one of the things of which I've been most proud is that each year, I've been able to expand the blog with a new feature, beyond the essay that appears most Wednesdays. In 2013 it was the introduction of "This Week in TV Guide," the smartest thing I ever did as far as the blog is concerned. In 2014 it was "Around the Dial," where I could spotlight the great writing at other classic TV blogs. Last year, I added "What's on TV?" which allowed me to look at the listings for one complete day from the TV Guide I just reviewed. Will 2016 see a fifth day added to the blog's schedule? I don't know - it depends on a lot of things (more about that later), but if there were to be another feature, it might be something such as a video clip from one of the programs in that week's issue. If that doesn't happen though, I'm quite happy with the way things are right now. Readership is at an all-time high, thanks to the great participation from members of several Facebook pages devoted to classic television and TV Guides. You've all done a great job of sharing my articles and commenting on them, both at the blog and on Facebook, and I'm grateful not only for how you've increased the blog's visibility, but the requests and suggestions you've made. I add you to the loyal readers I've had from the beginning, the ones who kept things going through the first couple of years with comments and emails, those of you like Mike Doran, who have shared an incredible wealth of information and detail that make the blog that much more informative. As more people read the blog, they link to it. And on that subject, I'll make a specific request for your help. For some reason*, I don't get notices of pingbacks when other blogs link back to a specific story. There could be a robust conversation going on about something I wrote, and I don't know anything about it. I don't like that, because at the very least if someone links to one of my articles I like to give them the courtesy of thanking them for it. So if any of you out there have any suggestions as to how to rectify this, whether by fixing the blog template or directing me to a site that collects links, I'd be much obliged. I don't really want to give people the impression I'm ignoring them. *Probably because I've fiddled too many times with the template over the years, and now it can't track back to other links even if it wants to. As for the coming year: This Week in TV Guide continues apace, though I may do what I did last August and take a further look back at an issue I've already covered. I can't, however, guarantee that this feature will continue on a regular basis beyond 2016. There are several reasons for this: first of all, any feature such as this will by definition be a finite one, given that TV Guide no longer exists as it did in the issues I cover. No matter how large one's collection is, someday you'll run out of issues to review. And my collection is far from being an inclusive one, though it has grown over the years. Issues from the time period I'm most interested in, the '50s through the early '70s, are not as readily available as they used to be, and quite frankly, they cost money. Some of them cost quite a bit, though I've yet to be in a situation where I had to have one of those expensive issues. But when you begin to purchase issues specifically based on the date, rather that the content, you sometimes are forced to spend more for that particular issue, just based on what's available at the time. Unlike some bloggers, I've never set up the means for readers to donate to me. I'd be a bit sheepish about that, since we've got jobs that pay us more than enough money to get along on. It's merely a matter of whether or not buying old TV Guides is the best way to spend those dollars. I've got about half of 2016's issues lined up, and I should be able to get the 20 or so needed to finish off the year. But as I've said, I can't guarantee I'll be able to keep going beyond that. Now, if you want to send me some TV Guides that you might run across, I won't turn that down; Hadleyblogger Steve from In Other Words sent me some very nice issues for Christmas, and I can guarantee they'll find a place in the blog this year. If you happen to run across some issues at a flea market or antique store and think I might be interested, I'd think you were very kind. I should also mention that if you own an issue you'd like me to write about and want to loan it to me, I can promise you I'll take very good care of it and return it to you as soon as I'm finished. Finally, I appreciate all your emails and comments, and I'm sorry that I don't always answer them, or answer them in less than a timely way. Part of that may be due to personal or work obligations (I do have a regular job, sadly), but a bigger part may be due to my other writing obligations. As many of you know, I published my novel The Collaborator last fall (and if you haven't purchased it yet, why not? ), and at the moment I'm working on what I think (hope?) will be the last major draft of my next novel, The Car. That should be ready for publication some time this summer or early fall. Now, continuing to blog here four days a week, plus editing In Other Words, plus writing a book, is not easy. I'm not complaining though, because it's what I want to do and what I enjoy doing. Last year I would get two or three weeks ahead on my stories here, and then spend a couple of weeks doing nothing but working on the book, so if I let comments go for awhile without answering them, or if I'm tardy on your emails, I hope you'll understand that I'm not ignoring them. I'm just busier than the proverbial one-armed paperhanger. In fact, I should have gotten this article finished a couple of days ago, but as you can see by the post time, I'm lucky to get it out today at all. So thanks once again for your patience and your support over the life of this blog, and I hope to promise you more and better material this year. If you have anything at all that you'd like me to cover, if you have a request for a specific TV Guide or want to see the listings from a particular date, or if you have suggestions or comments, please let me know. Because without you, this blog exists in a vacuum tube, and the TV business got rid of them long ago. And that's the State of the Blog, 2016. Will look forward to another year of interesting and insightful posts. Wish I had your work ethic - usually the best I can do is get 3 pieces up on my blog a month. Thanks, all - I appreciate your kindness and your interest throughout the year. Here's hoping for another great year indeed! To David - I'm sometimes reminded of something the author Paul Auster once said: "Writing is no longer an act of free will for me, it's a matter of survival." I don't go quite that far, but there is something that draws me to communicate through the written word, and I feel almost compelled to do so, particularly when I'm not writing.